I do not know where the time has gone. Jackson is growing up so fast and it is very hard for his Mommy to loose her baby boy. However, he is getting so smart and learning so many new things that amaze me every day. He has learned to count to tortteen (14) and he is so proud to show you this skill if he is in the mood! He is also very mechanical and is constantly trying to take things apart and put them back together. Yes right now this is on a small scale but I fear the day when I walk in and he has taken something important apart. On July the 11th we had Jackson's birthday party at MeMaw and Popee's house since our has was still not ready. We had a fun pool party with an amazing Thomas cake. Jackson was not sure about his cake at first so he stayed away from it, then he tried to touch the flame and finally he blew out the candle! Then as soon as the cake was cut Jackson headed right to the pool! He has spent most of the summer swimming swimming swimming so he thought the pool party was a wonderful idea!!! A 5 month update on us!! Ok well I know it has been forever since my last post. I always have the best of intentions but somehow life just gets in the way and I got farther and farther behind. I really began to think of the "catch up" blog as a monster I wanted to avoid. I had thoughts of a 200 pic blog with text resembling the length of a term paper, and that was just not a good thought for me. So I gave myself some tough limits. The Jackson section of the blog will be limited to no more than 3 pics per month. And I will be catching everyone up on the "big stuff" from the last few months. So of course I will start with the Jackson portion of the blog. First, I never blogged about Christmas so lets start there. Christmas was wonderful at our house and Jackson loved all of the new toys he got. Now let me say he is not in the I love Santa fan club. But he does love the haul of new things he got from the big fellow and everyone else. His favorite toy was his sound effects Elmo kitchen. Jackson and our Tree on Christmas Eve! Jackson on Christmas Morning as he walked into the living room to find all his gifts from Santa. He just froze and looked at all the stuff that he was sure was not there last night..... Jackson spent most of Christmas Day cooking in his Elmo kitchen. I bet he opened and closed those doors a few hundred times just that one day!! January was also very eventful for Jackson and for our team of course. So the day before "The Game" Jackson came down with a stomach virus and was really sick. The day of the game we had a snowfall and the roads got a little messy. We cancelled going anywhere and watched the game just the 3 of us. But as for the game we loved it and Jackson stayed up for the entire game and it was very nice to watch the game with my 2 favorite boys. So the day after the game Jackson was still very sick and later that night he got dehydrated and needed to go to the ER. So at 11 pm we headed to Huntsville to the pediatric ER for an IV. Jackson felt so bad and I had gotten so worried about him. I was relieved that he got the IV and almost instantly started feeling much much better . For a few minutes I thought Jackson was over his virus and we took him out for a few quick pics. Bbut after about 2 minutes and 5 or 6 pics he was so tired, that we did not play we just headed back in to get back in his pj's. Chad and Jackson after the "BIG WIN"!!!! And this is how they spent most of the game also. But no matter how our plans changed earlier that day the ending that night was perfect. Gotta love watching my boys watching our team win it all! Moving on to February and Valentines Day and guess what more snow...... Jackson was able to enjoy the snow much more this time around. Although, he was not so sure about it at 1st he quickly figured out how fun it was and had a blast!! Jackson, Chad and I spend lots of time outside playing in the snow and we even took the time to build our own Bama snowman!! Jackson loved the snow and might I say has some really good snow boots for his adventure! Like many holidays Jackson is not able to see all of his family on the actual day so I do my best to send out cards and such to help celebrate the occasion. This was one of the pics I took that was on his Valentines Day card for 2010. Moving on to March. I will explain more of this later but we put our house up for sale and actually sold it in March. We took every chance we could to play in the yard and enjoy our deck before the move. But guess what March also brought .... yep more snow! At this point it was getting a little bit old. 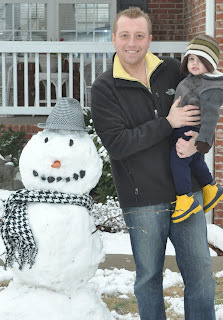 (There were actually 2 more small snows that did not make the cut for the blog). 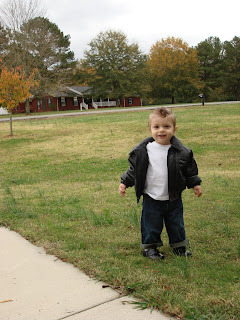 And one Sunday we took Jackson to Popee's (Chad's Dad) farm. I thought he would be scared of everything but no he wasn't He was not scared of the chickens walking all around him, the goats less than 6 inches from him or even the cows when they were mooing. He loved all the open area and time to run. Oh yea and those snow boots had another use. Here his Popee is showing him a 2 day old baby goat. Jackson and the snow from March. Jackson playing in the back yard about a week before our move. Now on to the update for April and finally some nicer weather. We are not huge fans of the lack of space we have in the rental house so we spend lots of time out of the house. Be it with friends or family, at the park or at our new house site we were out a lot of April. In addition, in April we had lots of fun as we celebrated Easter. Jackson was not so sure about the tie I got for him but he looked really cute!! Now if someone can just tell me how to get his shirt to stay tucked in. I just gave up and let him wear it out. One of our park adventures. Jackson really loves the park and is not scared of anything! Jackson on Easter as he opened his basket. My big boy in his Easter outfit!! Now up to the housing situation update. In February we decided to sell our house and build a new house. So we did a few little things that needed to be done and placed it on the market. The house was shown 3 times and we got an offer and exactly 1 week after we listed the house and it was sold. We had just over 3 weeks to find a place to live for the next few months and to move there! Yes it was more than crazy. But we found a small older house to rent until our house is built. It has been a huge adjustment for all of us but we are making it work. About 2 weeks ago ground was broken on our lot and we now have footings poured and the block laid for the crawl space foundation. We hope by the end of next week to have walls up. Our builder says that we will be in the house by the 1st of September. I am a bit skeptical of this but I hope he is right!! We have been making lots of decisions the past few weeks from paint, to lights, to fixtures and on and on. I am an over thinker and this process has been exhausting. So now we are up to date. I will try to do a better job of keeping this current from now on. But if I don't well you know that life again got in the way!!! Upon getting home with our '09 Christmas tree we did encounter some small problems. Problem 1: The 1st time we set up the tree it was NOT straight. Now the blame for this can go in many directions but nevertheless the tree was leaning. BAD. This was a problem for me and for Chad. So 4 sticks and 1 brick piece later the tree is now straight. Problem 2: Our brand new from Home Depot tree stand specifically made for trees over 8 ft (ours is 9) leaked. This was a problem that we did not discover until the tree was in the stand. But leave it to the red neck repair kit and duct tape it was fixed no problem. And almost 4 weeks later it is still holding strong!! Problem 3: Jackson was napping as we decorated the tree. So we decided that we would put all the breakable ornaments up high so Jackson could not destroy them. We separated the ornaments into a breakable and non-breakable area and we got all the non-breakables on the tree and guess what..... Chad's phone rings and he needs to go to the office to help a customer. (And since he is paid via commission he headed in). So of course Jackson wakes up screaming and all the breakable ornaments are still in the floor. And I as any good Mommy go into his room get him out of his bed. Then I make sure he has all of his favorite toys to play with and then shut his door and leave him in his room by himself to quickly put the ornaments on the tree and let him out to see our Bama Christmas Tree. Jackson looked at the tree -- tried to touch one thing --- Mommy said NO NO and he now acts as if it is normal to have a 9 ft tree growing in our living room. Here is our Bama Tree. 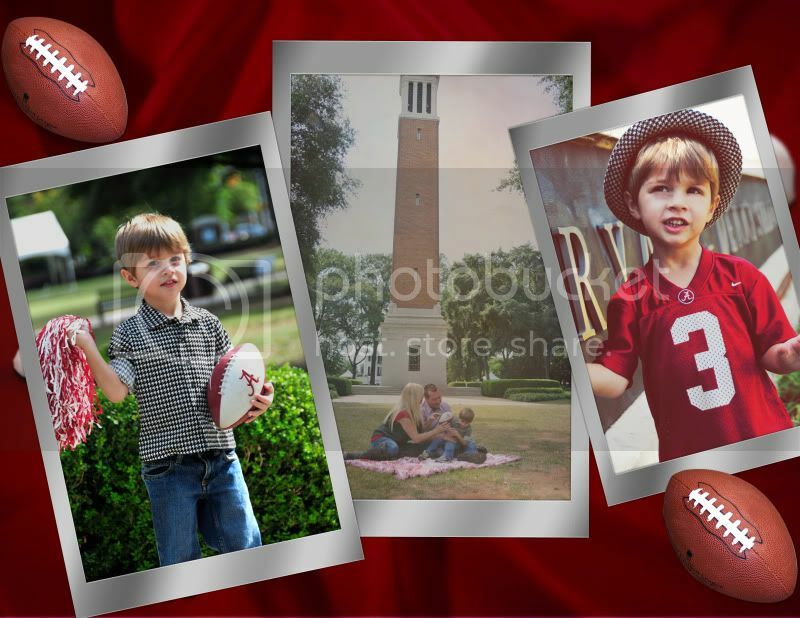 Now I am sure Bama Tree's are all the craze this year but no our Bama tree dates back to 1998. I started my Bama tree in '98 and when Chad built his house in '05 he started a Bama tree also. In '06 our Bama tree's joined forces and got it's tree topper (Yes a Houndstooth hat) and the rest is Crimson Tide history. Here are some of our Bama decorations on the tree. As most of you know Jackson also has a Bama baby room (see post from May or June 2008) and so I thought this stocking made a perfect door decoration. Here is Jackson after I let him out of his room and he saw the tree for the 1st time. And of course like any curios little boy he had to touch it. Yes they did think that Jackson was going to allow this but believe me it did not last very long at all and he was off and running. Before we left for dinner we took a family picture and you will notice that Jackson has a slight halo. This is quite funny because he is all boy and would tarnish the halo image. But of course he will always be his Mommy's angel!! Chad and Jackson in front of the door at High Point. I just love these guys so much!! Here are a few shots inside and outside of the restaurant of Jackson. It was an old stone building and had tons of small rooms and a great patio area outside. I will be going back to this place.... hopefully soon!! Here is the 2 year comparison of my sweet little boy. Now the process of creating a 50's Grease Guy was really easy except the hair so here is what was required for the hair. Step 3: Twist and twirl hair and spray, spray and spray some more. Apply black leather jacket, roll up pants and put on white socks and black shoes and you have the spitting image of an original 50's guy. Oh yea and we also went to a Halloween party with the theme of "tragic endings" so we went as a vampire and someone bitten by a vampire. Carson is 1 month old! My name is Miranda and I have the most wonderful husband in the world. Chad and I were married on March 17, 2007 (yes St Patrick's Day). I have twin daughters Peyton and Bailie who are 8 years old. I moved from the very small town of Centreville, AL about 4 years ago to Scottsboro, AL. Our wonderful little man Jackson will be 2 in July. I will try to keep you all up to date with everything realted to our family via this blog and maybe you will find a few other things you enjoy from it also!